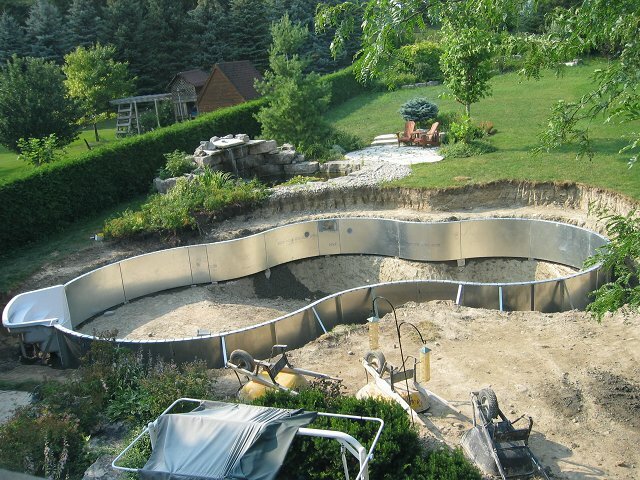 This blog is meant as a way for us to share our experience on a pool construction project. It is also meant to educate those looking into hiring a pool builder or pool contractor on what to look for before signing the contract. There is also information on pool supplies, equipment and maintenance. You may contact us for more information about our experience at hsaake@gmail.com. NOTE: We are getting a lot of emails asking about our opinion of our pool's builder, SurfSide. We are very pleased with SurfSide and their work. For a summary of our impression of SurfSide, please see the Fall section on the Project Log. 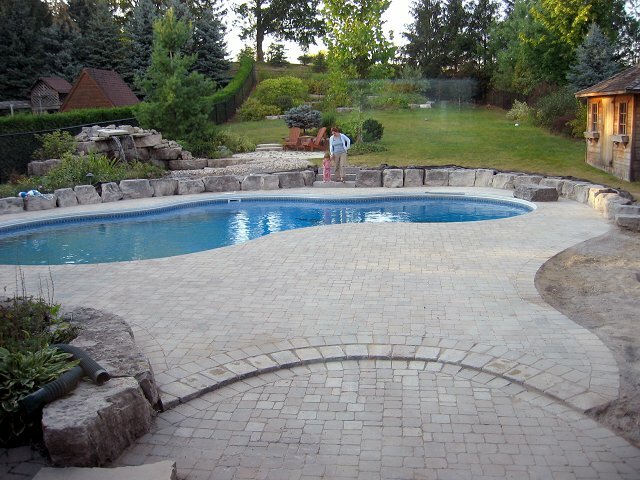 March/April - Requested quotes from local (Richmond Hill, Aurora, Newmarket) and best known Toronto area based swimming pool contractors after extensive Internet research. May 5 - Signed contract with Surfside Leisurescapes (a.k.a. 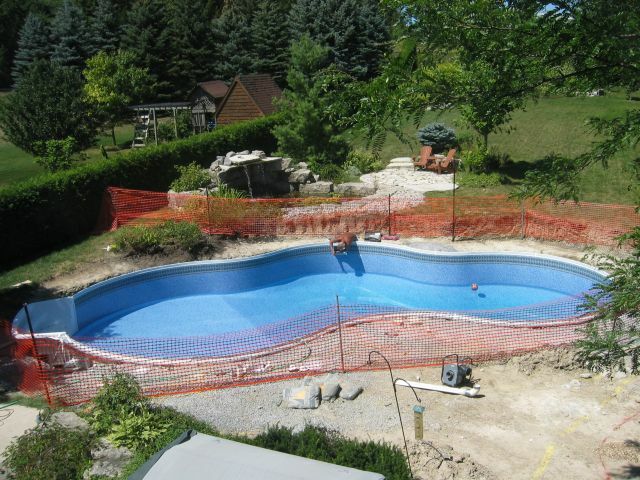 Surfside Dream Builders) - www.surfside.on.ca of Newmarket for a 40x20 vinyl swimming pool and landscaping, including 12 tons of armor stone retaining wall, interlocking deck and chain-link fence. Start date estimated at "end of June". May 12 - Received confirmation of inclusion into project schedule, a job number and estimate of job start of "late June". June 6 - Called Sales Rep to ask him for an update. Sales Rep promised to provide further information once he is able to look at information in the office. June 13 - Called Sales Rep. Confirmed we had not yet chosen liner and promised to provide a status on estimated job start date after a production meeting. We visited their store at 130 Mulock Drive in Newmarket and chose liner color/pattern. June 15 - Sent email to Surfside and left voice message for Sales Rep with the details on the vinyl liner we chose so they can expedite the order. June 19 - Sales Rep called. Mentioned they are behind schedule due to unforeseeable circumstances and suggested "early July" as new project start date. July 1 - Sales Rep visited. He brought copies of the documents he had promised to return. Reiterated that swimming pool construction crew is 2-3 weeks behind schedule due mainly to weather. Advised he and Project Manager would visit within a week or so for a detailed inspection and pool shape tracing. We appreciated his visit and are in high spirits about the pool project again. July 7 - Our Sales Rep and the Project Manager came today for a site inspection and pool tracing. Some minor changes had to be made after they offered good advise (E.g., pool too close to shed and playground equipment as originally planned/sketched). We were told there would be a 60/40 chance they could start the swimming pool construction within a week's time. July 18 - The Project Manager called today with good news. They will start the digging tomorrow. Hard to believe someone can be so happy about the prospect of having a big hole dug on their backyard. July 19 - Mini-excavator, bobcat (Caterpillar Compact Machines from Battlefield Equipment would have done the job better!) and digging crew arrived early. They worked hard all day and finished initial excavation in one day. Project Manager advised that pool kit will be delivered July 21 and that the crew will start installation July 24. July 21 - Equipment was delivered. It was dropped off on the side of the house (nobody was home at the time). July 24 - Crew arrived at noon and moved the steel panels to place inside the pool. July 25 - Panels and pool stairs were assembled today. Concrete was poured behind them after rain stopped. July 27 - Panels were backfilled with gravel. Pool plumbing system setup started. 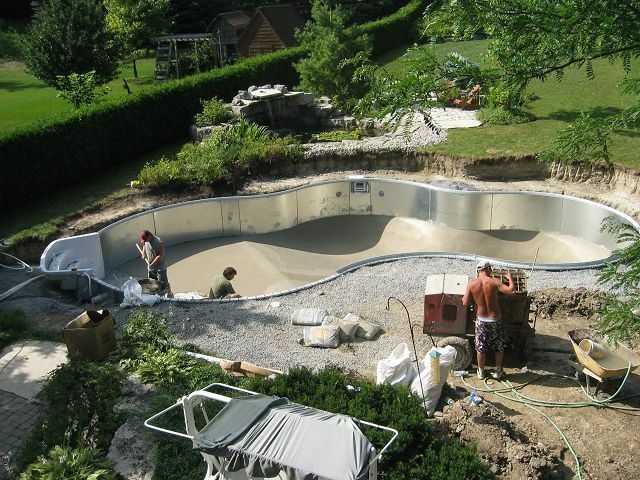 July 31 - Concrete was poured inside of pool. August 2 - Coping around pool was started. August 4 - Smooth coat of Vermiculite and concrete mix was trowelled by hand throughout bottom of swimming pool. August 8 - Vermiculite/concrete bottom was sanded by hand. Electrician inspected the site and said he would return tomorrow to make the necessary connections and fix the low voltage cable that was severed. August 9 - Coping around pool was completed. Liner was installed. Electrician did his job. Gas was hooked up to heater. Pool water fill-up started. A (noisy) fan was left running while pool is filling to minimize possibility of liner wrinkles. We were told to call once the pool's shallow end has a foot of water (likely around noon tomorrow - after 24 hours based on our house water pressure). August 11 - Exhaust fan was removed. Openings for lights and outtake/intakes were cut off and trim installed. Happy Birthday Eric! August 14 - Fence was installed on one side of property. The other side will be installed tomorrow. August 15 - Fence was installed on west side of property. Only part left is main gate - will be done after interlocking is completed. Pool equipment (heater, pump, filter, chlorinator, lights, etc.) was tested and turned on. 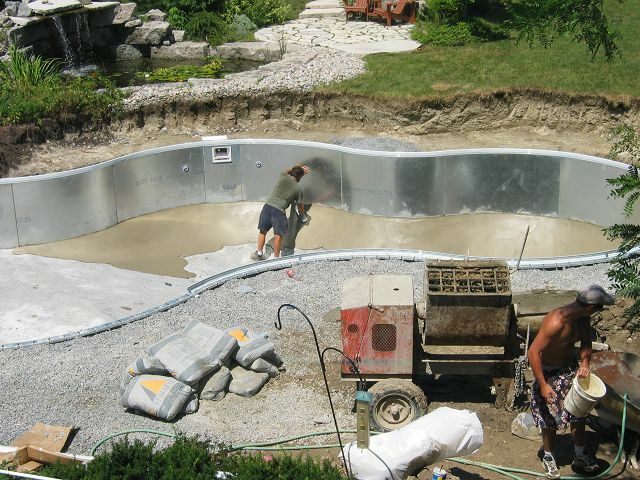 August 17 - Backfilling of pool with gravel was completed. August 18 - Preparation for interlock stone deck started. August 19 - Armor stone was delivered. Tip: make sure heavy product is dropped on the grass - not on the driveway - it is easier/cheaper to fix grass than patch the driveway. 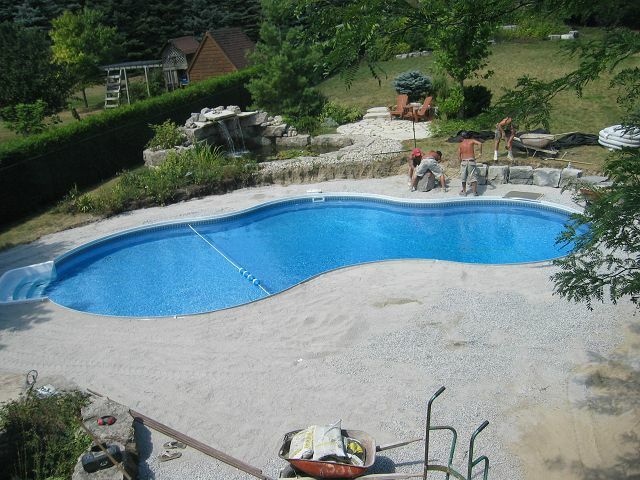 August 21 - Deck (interlocking stone) crew arrived early and worked all day. August 22 - Deck crew continued work and installed over 20 armor rocks. After they left for the day, gravel was delivered and fell into the street. Called Sales Rep after business hours to inform him. He sent a crew to clean it up within minutes. August 23 - Deck crew finished installing armor rocks and started on interlocking stone installation. August 24 - Interlocking stone installation continued. We are very happy with the results so far. AquaGenie device or pump appears clogged due to debris from interlocking installation. August 25 - Interlocking stone installation continued. Project Mananger checked system but stopped working again in the early evening - appears clogged. August 28 - Interlocking stone installation continued. Sand was tampered betwen interlocking stone deck. Pool system remains clogged. After I followed instructions given by Sales Rep over the phone (to shut down the D.E. Filter to let it "recharge" for 3-4 hours) and cleaning AquaGenie skimmer's and Pump's baskets, system started working again. Pool bottom is dirty with gravel, stone dust and sand from interlocking stones installation - this is normal and someone will come to clean the pool this week. August 29 - Interlocking stone installation completed. We are very pleased with the work/results. 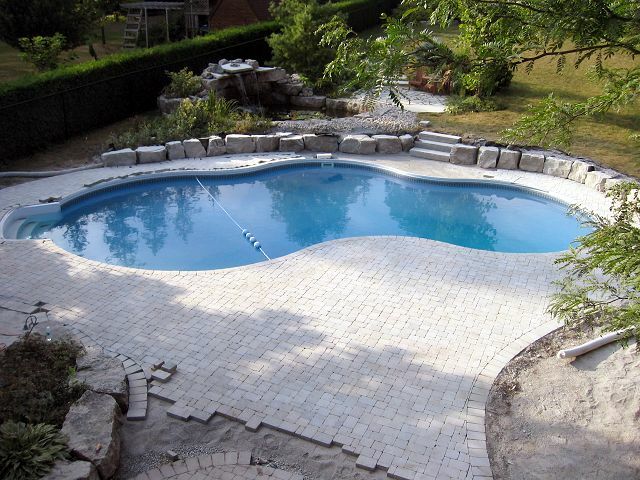 Diving Rock and side sitting area (3 armor rocks and interlocking) was also completed. They fixed a grading issue on the old patio. John's crew was terrific. August 30 - Pool was cleaned and pool ladder's hooks were installed on the previously made concrete slab. Pool needs another vacuuming to be completely clean - this is expected. Significant amount of water was lost in the process. Hose was left on directly next to the skimmer's intake, over the basket, to refill the pool to the appropriate level. August 31 - Access route was cleaned/graded. Gate was installed. September 1 - Operating instructions were given by Sales Rep.
September 5 - Ladder was installed. Solar cover was cut to shape and dropped in the pool. 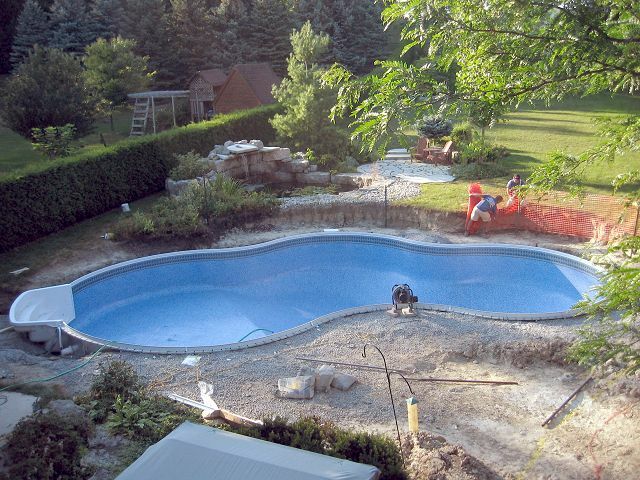 Fall Our pool builder, SurfSide of Newmarket, Ontario did a good job building our pool. We are very pleased with their work and we had a good experience with their staff. 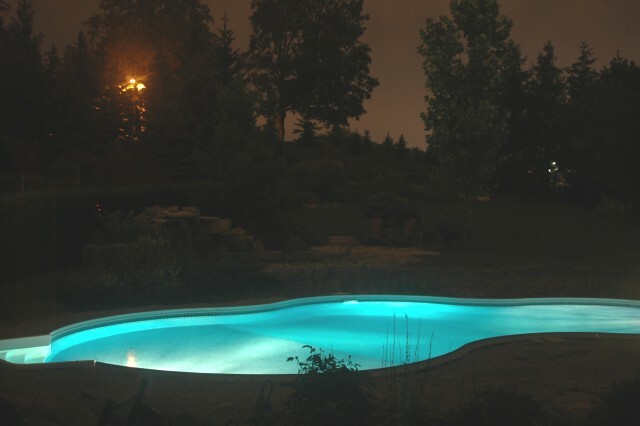 Our Sales Rep/Designer had excellent ideas and we are glad we listened to his advice when selecting the shape of the pool, liner, lighting, equipment, location, etc. He was also very knowledgeable on the latest available pool equipment and offered good maintenance tips, most of them based on is own experience as a long time pool owner. Their construction and interlocking crews were excellent. They hire very experienced individuals and most of them build pools all year (yes, even in winter - they will put a heated dome on the site and work in January...). They were all very professional. Our Project Manager was good in getting back to us with information, in most cases was easy to reach and kept to delivery dates. 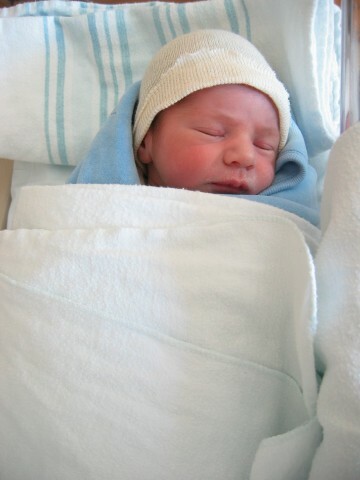 Overall we are very satisfied with SurfSide and highly recommend them. Quotes will usually require from 1 to 3 hours of your time. Make sure to keep a copy of any paperwork the contractor writes up that day - it may become the basis for your contract. Do not go by impulse (because the contractor is nice, more educated, has million dollar backyard photos, etc.). Think it through. Check all references you are given. Hunch is important - but facts more so. Sleep on it and do some leg work. Confirm that the photos they show you are indeed THEIR projects. Try to negotiate a lower down payment, particularly if you are unsure about the pool builder reputation. 20% is too much. 10% is a lot. 5% is acceptable. Add a clause that states that the contract can be cancelled and all monies refunded if	they do not commence work (digging) by x date. Most companies in the area have a 20, 50, 25 and 5% payment schedule - upon agreement, start of work, liner installation and final orientation respectively. Budget for extra costs. You will have to provide cheques for the down payment, city deposits ($3,500 in Richmond Hill !) and permit fee ($150 in Richmond Hill) at time of contract signing. Have a GOOD copy of your property survey handy. By GOOD I mean clearly legible. The Town of Richmond Hill, Aurora, Newmarket, etc. offer a service where you can get a copy of the original survey for a small fee ($5 in Richmond Hill) - this is usually a large, good quality copy. 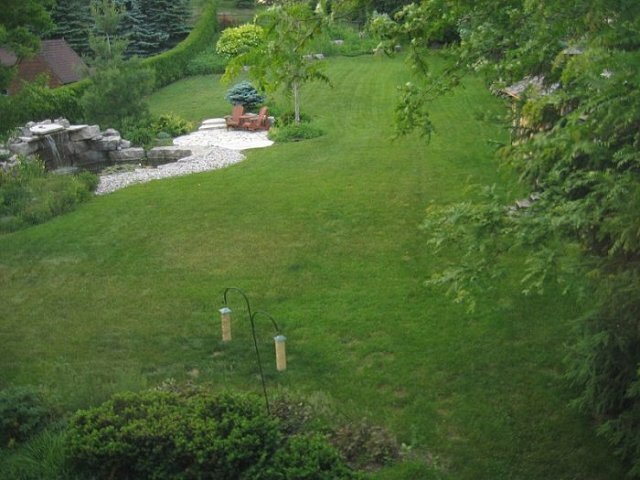 Contact Richmond Hill Building Department at 905-771-8810. A Mini-excavator (bobcat or better yet a Caterpillar compact machine from Battlefield) will be more expensive than a full size Cat Excavator because the small machine will take longer to get the job done (operator cost). We went with a mini because we did not want to remove certain trees (a large machine requires larger clearance) and felt a mini would cause less potential damage overall. Keep the crew hydrated with water bottles inside a cooler with lots of ice. Pop is not a good healthy choice (sugar and caffeine dehydrate) but some like it. Key is to keep the cooler cool with fresh ice daily - the crew will appreciatte it. Power or granola bars are good snacks to provide them. 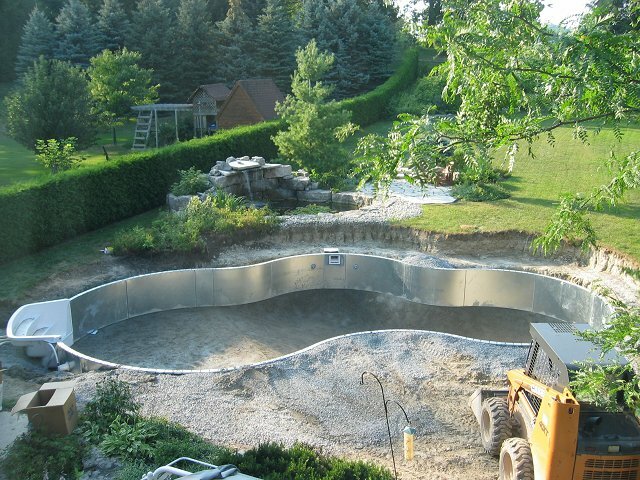 If I could to do it over again, I would have ordered the pool in late summer for construction in fall. It would cost more in interest charges but I think the project would have been less stressful - we don't use our backyard as much in the fall and the anticipation of swimming would not have been as bad and we would have had the swimming pool ready for spring. Proper grading and drainage is critical. 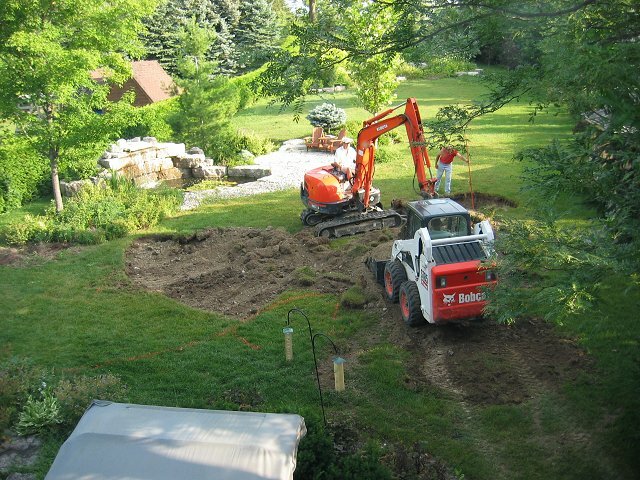 Verify and put pressure on contractor to ensure proper grading and drainage around swimming pool. 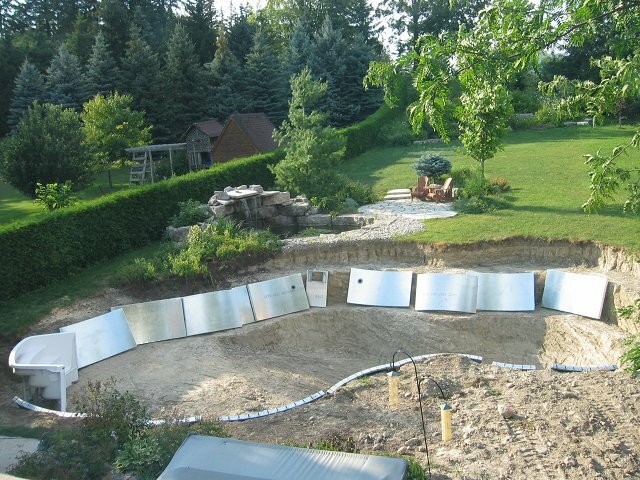 If your backyard slopes towards your pool, a French Drain behind the panels should be installed. Ask the contractor what they will use for the smooth coat that is under the vinyl. Make sure it is not grout or sand/cement mix. The better option is a Vermiculite/concrete mix trowelled by hand. If they agree to use Vermiculite, make sure it is stipulated in the contract and make sure they use a professional who has experience with the product. You will need to discuss your new fence (if you don't have one now and are getting one installed) with your neighbours. Here is a sample contract (MS Word - 26K) that can be used by two neighbours who are sharing the cost of a fence. A rope and floats is a more important option than you may think, particularly if you have young children or people who do not know how to swim in your family. If you are getting a D.E. Filter, you should make sure you can program the pump to go on and off at certain intervals. The D.E. Filer works best by allowing it to "charge". This hapens when it is "off" (the pump is not pumping water to it) for a period of 3-4 hours each day. Make sure there is a relay installed in the heater's control panel so you can program some off time for the pump on a daily basis. End of Day July 24 - Steel panels were placed inside pool. Start of Day July 25 - Steel panels assembled and leveled. End of Day July 25 - Concrete poured behind panels. 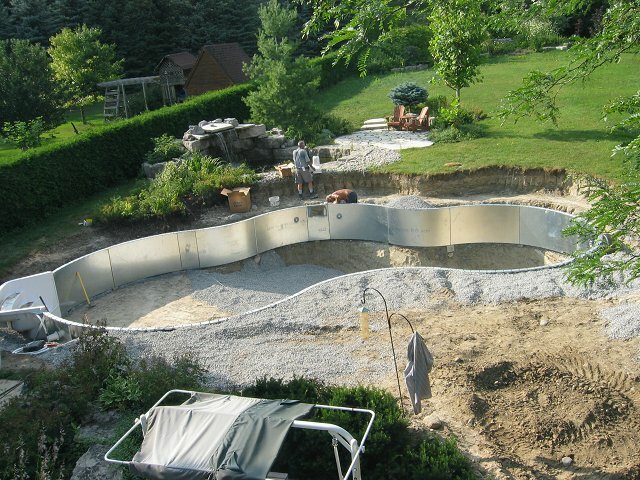 Start of Day July 27 - Pool backfilled with gravel and plumbing system setup started. End of Day July 31 - Concrete poured inside pool. 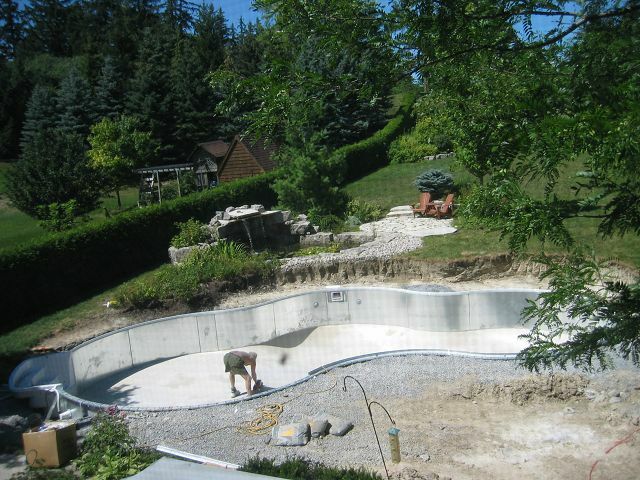 Start of Day August 4 - Vermiculite/concrete mix goes on bottom of swimming pool. Mid Day August 4 - Smooth layer is trowelled. August 8 - Pool bottom was sanded. 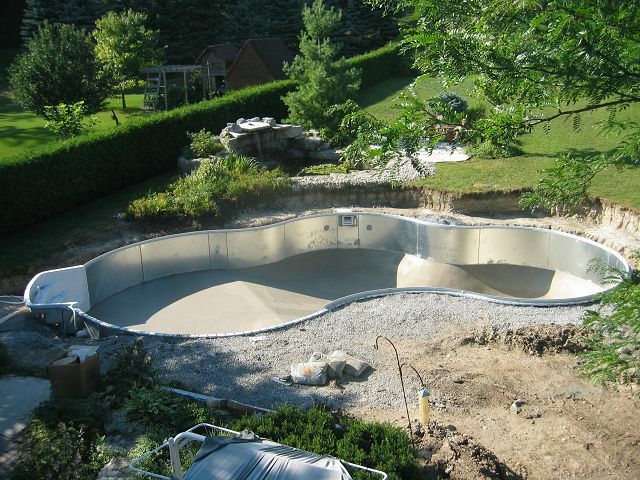 August 9 - Liner is in and pool is being filled. August 11 - Openings cut off and trim around lights, etc. were installed. August 14 - Fence on East side of property was installed. 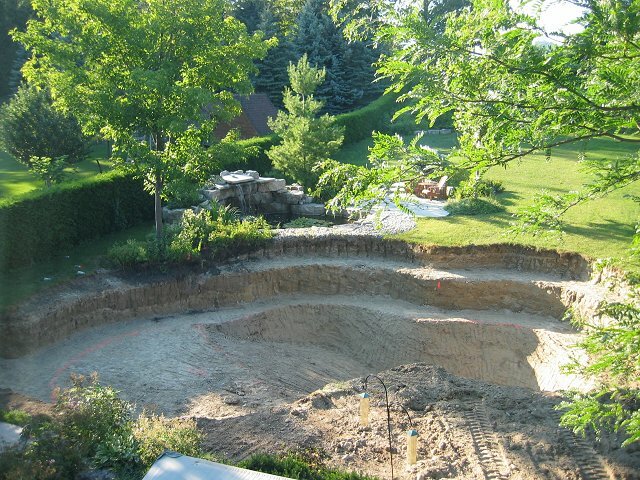 August 17 - Pool backfilled with gravel. August 17 - Lights are on at night. August 22 - Armor rock retaining wall installation started. August 23 - Armor rock retaining wall, sitting area, steps to nothern yard and drain installation (behind retaining wall) completed. August 23 - Interlocking stone deck installation started. August 24 - Interlocking stone deck installation continues. August 29 - Interlocking stone deck installation, armor rock retaining wall and diving rock installation completed.